Why do Mormons Believe in Polygamy? 1. Mormons believe that Joseph Smith, the founder of Mormonism, received a revelation from God in which he was commanded to practice polygamy. This revelation was recorded on July 12, 1843 and is part of the Mormon scriptures to this day (Doctrine and Covenants 2013, pp. 266-273). 2. Solemnizing such a union requires a specific priestly authority which the Mormons call “the sealing power”. They believe that Joseph Smith received this authority from the Old Testament prophet Elijah who appeared to him on April 3, 1836 (Doctrine and Covenants 2013, pp. 228-229). 3. However, Joseph Smith’s first extramarital relationship, considered a polygamous marriage by some Mormon authors (Bradley 2010), started in 1833 and 28 more wives would follow until July 1843 (Compton 1997, pp. 4-6). In view of the actual chronology, then, it seems logical to assume that Joseph Smith made up his revelation about polygamy to justify his extramarital relationships after the fact. 4. After this revelation, Joseph Smith married four additional women, the youngest of which was 14 and the oldest 56 (he was 37 at the time). The latter woman was Fanny Young, the sister of Brigham Young who would become Joseph Smith’s successor. A few of his closest associates also started with polygamy. In this way, polygamy became a loyalty test with dynastic characteristics during Joseph Smith’s final years. 5. Whereas Joseph Smith framed polygamy in a theological context, his successors displayed the familiar pattern found in anthropological literature: a large number of women as a symbol of the status and power of the ruling elite (Zeitzen 2008, p. 99). By marrying additional wives, men proved their loyalty to the Mormon hierarchy and in return received leadership positions and the wealth that came with them. In nineteenth century Utah, church leaders were two to three times more wealthy than ordinary members, the top leaders even ten times (Daynes 2001, pp. 128, 130-131). 6. Church leaders in those days also directed the members in civil matters, effectively making Utah a theocracy. To remedy the situation, the US government focused on polygamy as it was an issue that struck at the heart of Mormon theocratic power but also easily aroused public opinion. A brief military conflict (the Utah War) and a lengthy legal battle finally led to the end of Mormon polygamy at the beginning of the twentieth century. 7. 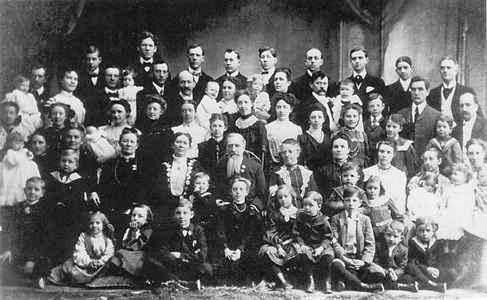 Today, the largest faction of Mormonism, the Church of Jesus Christ of Latter-day Saints, no longer practice polygamy although it is still a part of their theology. Some marriage policies are still shaped around the principles of polygamy (see note 33 of the article Plural Marriage in Kirtland and Nauvoo) and modern Mormon women still fear they will have to enter into a polygamous marriage in the afterlife. However, the beginning of the twentieth century also saw the formation of dozens of fundamentalist groups that wanted to maintain the practice of polygamy. An estimated 40,000 – 60,000 fundamentalist Mormons currently practice or condone polygamy in the US (Zeitzen 2008, p. 89).